The weather has been great -- if you count 95 degree+ heat index and thunderstorms great! ;-) Hopefully between all this "No Computer Access" time and no more school or extracurricular activities I'm doing a lot of running. I guess time will tell. 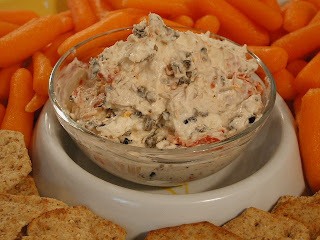 This quick and easy dip was quite the hit at a recent family potluck dinner. It was so simple that I hadn't planned to make it. I received my Kraft Food & Family magazine in the mail that day and it sounded so good I couldn't resist. I had all the ingredients on hand and threw it together right before we left. Delicious! MIX cream cheese and sour cream in medium bowl until well blended.